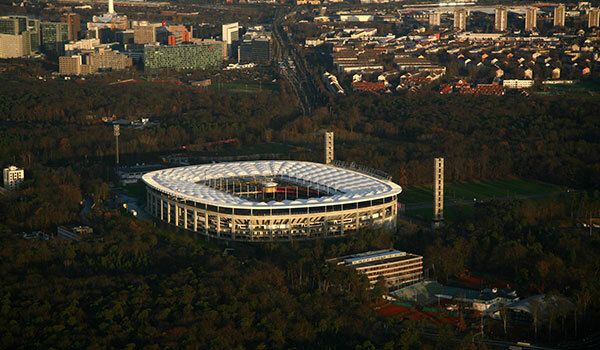 Located on the original site of the legendary Frankfurt Waldstadion, Commerzbank Arena is a professional sports complex that is home to the Eintracht Frankfurt football team. Originally designed as a football arena, the complex is now home to a pitch that is often used for other sport events and also open air concerts. Refurbished three times in its history, today the stadium boasts 51,500 seats, 74 VIP boxes, state-of-the-art technology, a church prayer room, and 5.700 sqm of conference and event space. The popular venue showcases a variety of national team matches and Eintracht Frankfurt games each year and has hosted prestigious events like the World Cup in 2006, the German Bowl and the World Bowl. Where can I find a seating chart for the arena? The stadium offers a detailed map of access roads, parking lots, gates and seating. The map is divided into four color-coded sections so it's easy to find your way around the stadium and into your assigned seat. Visit the Commerzbank Arena website for a detailed map of arena seating. Where can I find a football schedule? The Eintracht Frankfurt team generally plays 17 home games during the Bundesliga - Germany's premier football competition season. Matches are held from August through May each year, with DFB Cup Championship match games held in June. Visit the Commerzbank Arena website for detailed schedules, tickets and game day information.